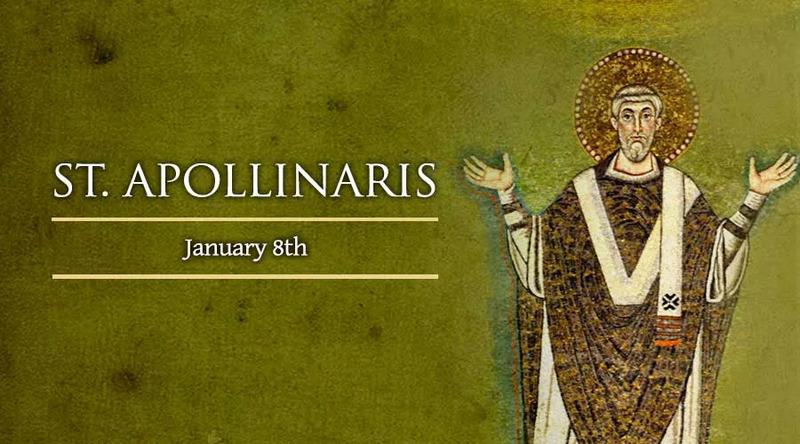 St. Apollinaris was one of the first great martyrs of the church. He was made Bishop of Ravenna by St. Peter. The miracles he conducted in Ravenna soon attracted official attention, for they and his preaching won many converts to the faith. However, at the same time, his words and works brought upon the fury of the pagan people who beat Apollinaris cruelly on several occasions. During one beating, Apollinaris was cut with knives, and scalding hot water poured over his wounds, then put on a ship to be sent to Greece. In Greece the same course of preachings, and miracles, and sufferings continued. In fact, after a cruel beating by Greek pagans, he was sent back to Italy. When Emperor Vespasian issued a decree of banishment against the Christians, Apollinaris was kept hidden for some time, but as he was leaving, passing through the gates of the city, he was attacked and savagely beaten. He lived for seven days, foretelling that the persecutions would increase, but that the Church would ultimately triumph.